Did you know that you can rename Chrome tabs? Like almost any other browser, Chrome takes the title of a website and displays it as the tab name. Since most websites use meaning full titles for their pages, grabbing the title and setting it as the tab is name is generally fine. However, there will be times, especially when doing research on a topic with a lot of open tabs, web pages will have pretty similar titles. This makes it hard to quickly differentiate and navigate between them. In those, situations, you can easily change chrome tabs name to anything you want for better organization. Without further ado, let me show you how to rename chrome tabs on Windows or any other operating system. Google Chrome doesn't have any native options to rename tabs. However, like for many things, there are a few extensions to change chrome tab title. Tab Modifier is a productivity extension that lets you rename chrome tabs along with doing other things like preventing a tab from closing, preventing duplicate tabs, muting audio of selected tabs, and changing tab icons. 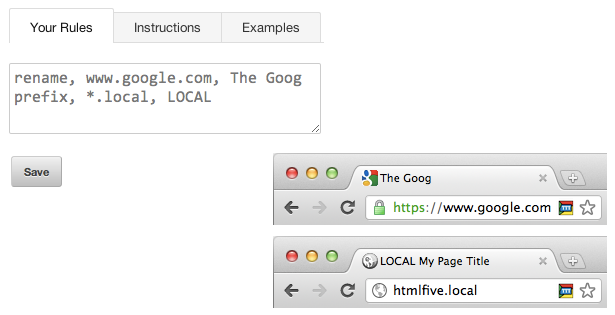 The best thing about Tab Modifier is that you can create URL or website specific rules in the extension settings page. These rules are applied to that target website or page automatically. 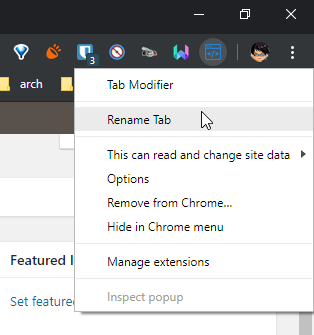 How to use Tab Modifier to change tab name: Open the target webpage, right-click on the extension and select "Rename tab". Enter a new tab in the pop-up window and click on the "Save" button. A new will be created in the Tab Modifier settings page. From now on, that specific website will have the custom name set by you. To remove the custom name, go to the Tab Modifier settings page and delete the relevant rule. As you can tell from the name, Tab Title Tweaker lets you quickly change the name of any chrome tab. Just like Tab Modifier, this extension works based on rules. Once you set a rule, it will be automatically applied to that website or web page. That being said, Tab Title Tweker is not as feature-rich or user-friendly as Tab Modifier. However, it still is a pretty good extension to rename chrome tabs. Just experiment with it and see how it works for you. 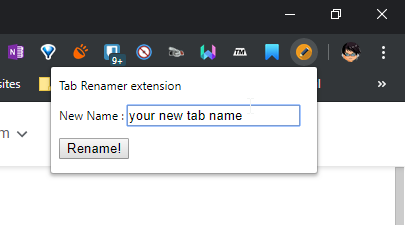 How to use Tab Title Tweaker to change chrome tab name: Right-click on the extension and select options. In the available field, add a rule just as it is shown in the "Examples" field. If you are looking for a simple and lightweight extension to rename chrome tab then Tab Masker is for you. No matter what tab you are on, you can easily rename chrome tab title using Tab Masker. Being a simple application, there is no settings page. Moreover, any changes you make to the tab title are not persistent. i.e, the tab name will revert back to its original when you close and reopen the tab or when the tab is reloaded. 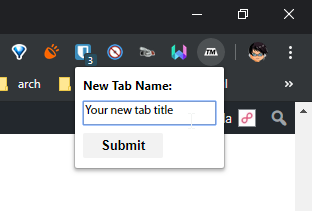 How to use Tab Masker to Rename chrome tab title: Install the extension, visit the web page, click on the extension, type a new chrome tab name and click on the "Submit" button. As the name suggests, this is a very simple and straightforward extension to rename chrome tabs. In fact, Simple Tab Renamer is very similar to Tab Masker. Once you rename then tab, it only stays that way till you close or reload the tab. Use Simple Tab Renamer to rename chrome tabs: Click on the extension icon, enter a new chrome tab name and click on the "Rename" button. As you can see, there are quite a few extensions to rename chrome tabs. Try them and use the one that fits your need. For instance, if you are looking for an extension that stores the changes and lets you change chrome tab title and icon then try Tab Modifier or Tab Title Tweaker (no icon modification support). If you just want the ability to rename chrome tabs and don't mind the tab title reset everytime you reload the web page then try Tab Masker or Simple Tab Renamer.